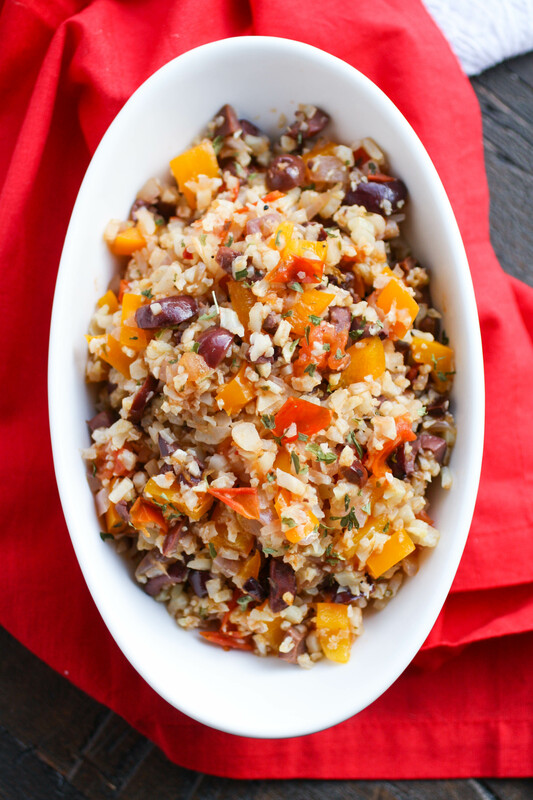 Mediterranean Cauliflower Rice is just what I needed after indulging in rich holiday treats. 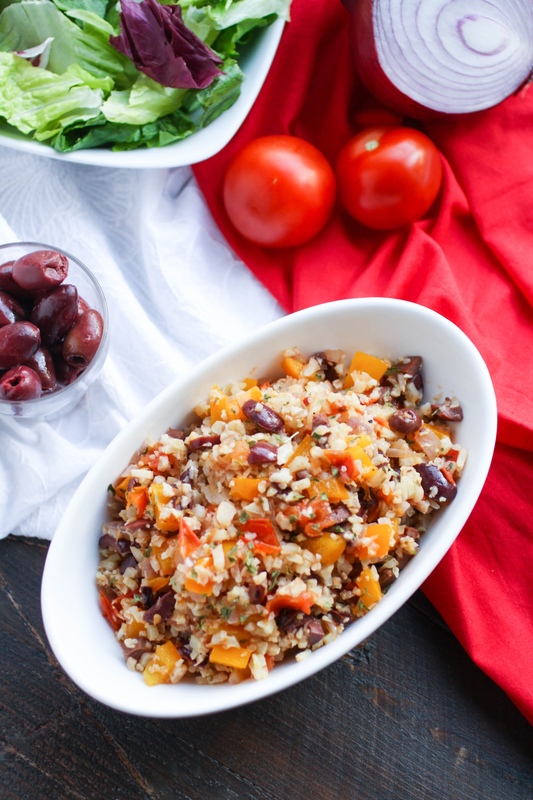 This salad is wonderful warm or chilled, and it makes a delicious addition to a light meal. You might also love the cookbook giveaway at the end of this post! I’ve eaten my share of Christmas cookies this season, and we still have New Year’s celebrations to get through. I am eager to start eating a little healthier, which is why I was excited to recently receive a great cookbook from the American Diabetes Association (ADA). Check out the giveaway at the end of this post! After flipping through the split pages of the cookbook (showing mix-and-match options for breakfast, lunch, and dinner), I decided to make Mediterranean Cauliflower Rice. I love anything with a Mediterranean vibe, and I love cauliflower. If you’re a fan, too, try my Kung Pao Cauliflower recipe. It’s a like take out but better! According to the ADA, nearly 30 million Americans live with diabetes, and 1 in 3 face pre-diabetes. 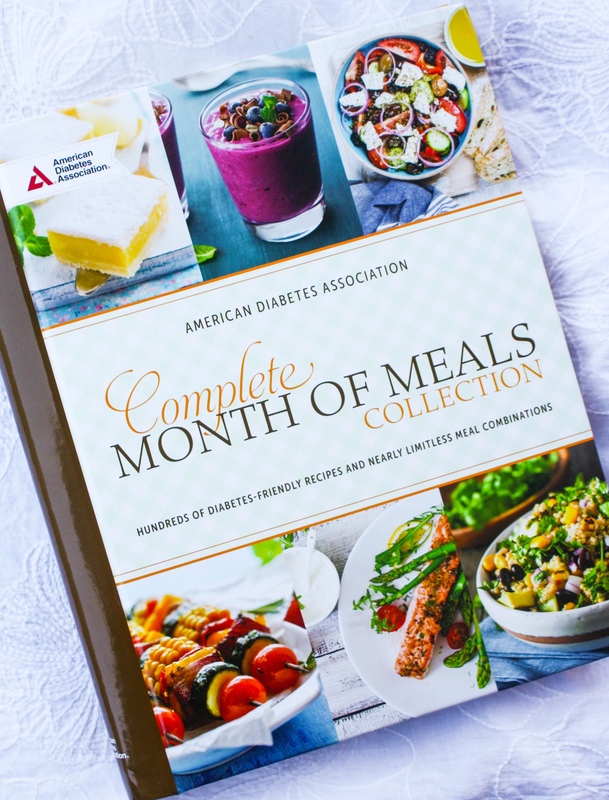 Whether you have diabetes or you’re looking for healthier meal options, consider the ADA’s cookbook, The Complete Month of Meals Collection: Hundreds of Diabetes Friendly Recipes and Nearly Limitless Meal Combinations. You’ll find help with meal planning and a trove of healthy recipe options — including Mediterranean Cauliflower Rice — in this cookbook. All the recipes are designed to meet the ADA’s updated nutrition guidelines. I used prepared cauliflower rice from Trader Joe’s (this has been a busy season!) but you could make your own by simply whizzing up a head of cauliflower in the food processor. For more details on how to prepare cauliflower rice check out my recipe for Kimchi and Cauliflower Fried Rice with Poached Eggs. This recipe is beyond easy to make. I added some seasonings of my own — black pepper, crushed red pepper, dried parsley, and of course, garlic. You can switch things up as you like, or follow the recipe to the letter. 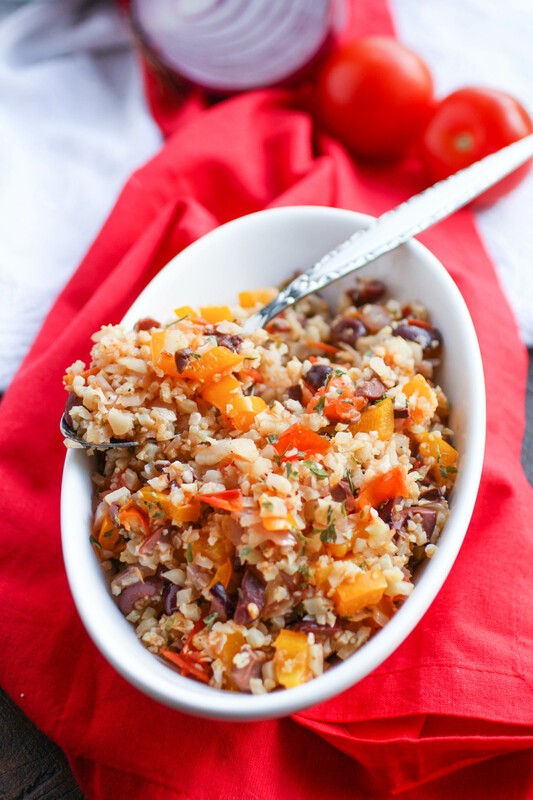 I loved this cauliflower rice dish the next day, cold, straight from the fridge! It’s the perfect side to serve as part of a light and healthy meal. I think you’ll love this cookbook, as much as I did. I have an extra copy for one lucky reader (this giveaway is open to U.S. residents only). Enter the giveaway for your chance to win a copy of your own! The cookbook will be sent to one lucky winner after the giveaway has ended. This is a lovely side dish to serve as part of a healthy meal. This is an easy-to-make and flavorful side. Add the olive oil to a skillet over medium heat. When hot, add the tomato, bell pepper, onion, and olives. Finally, add the garlic and cook for 90 seconds or so. Cook for 3-4 minutes, or until the vegetables have softened. Add the cauliflower rice, stock, black and red pepper, and dried parsley. Stir to combine. Cook for another 3-4 minutes or until the cauliflower has softened. I really love cauliflower, but I haven't tried it as a rice yet. Hi Dee! I hope you give it a try soon! It's so versatile and easy to add so many flavors and ingredients! Hi Nikki! I'll have to keep my out out for the frozen cauli -- definitely handy! Hope you like this dish, and the others, too! This sounds so yummy! I love Mediterranean food! Thanks, Kelsie! Me, too! I hope you give this dish a try and enjoy! Hi Kyla! YES! I was thinking the same thing! This is a great all-season dish! Thanks for stopping by! 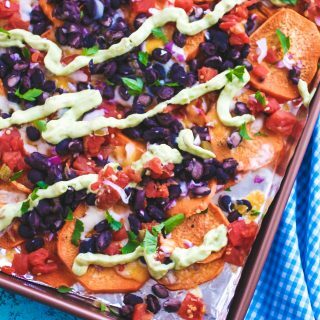 A healthy and yummy recipe! I loved how the flavors of the ingredients in this menu, for sure itll be so tasty! Thank you! I hope you give this dish a try - you're right -- great flavors! Crazy... I've never cooked cauliflower before! I can't wait to try this recipe. It looks amazing! Hi Jan! Well, maybe the time is right to give it a go! I love the flavors in this dish - bet you'll enjoy it too! Yum! Cauliflower rice is our favorite -- and we're always looking for ways to make it. We basically never eat rice or potatoes anymore. Hi Valerie! Wow - that's amazing! I do still eat rice, but I can see how easily I might be able to phase it out more! Thanks so much for stopping by! I am not Diabetic, but a dear friend of the family is and it has been difficult to get her to make the life changes necessary to keep it at bay, particularly her diet! Hi there, Tracy! It's always hard to make a change, but I hope your friend will find some great recipes to help. Thanks for stopping by and hope to see you again! I love cauliflower in all its forms and yes I've tried a rice dish before - it was so god. I'm with you, Annette! I love cauliflower any way I can! Thanks for stopping by, and hope to see you again here! 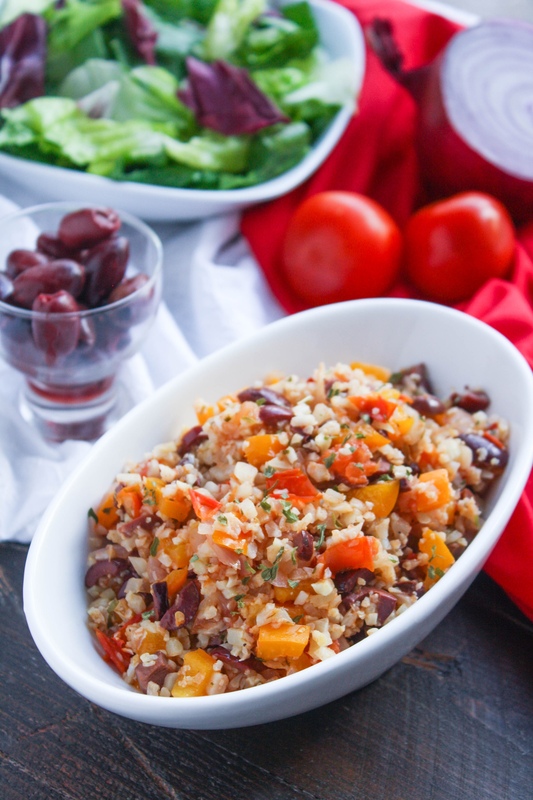 I just recently tried cauliflower rice and can't wait to use this recipe! I have not tried cauliflower rice yet. My favorite cauliflower dish is sauteed cauliflower in olive oil. It is absolutely delicious and the perfect side dish! That sounds great, Karenann! I love cauliflower in pretty much any version :) Thanks for stopping by -- Hope you'll be by again! LOVE it! I use the riced cauliflower for fried "rice". Hi Kim! What a great idea, huh? Thanks for stopping by (hope you'll be by again)! I have not tried cauliflower rice yet. I really want to try it in 2018. Hi Cindy! I hope you do -- it's really good! Califlower is a nice low carb substitute for potatoes or rice. I love it! I love it, too! Hope you give this dish a go!